Lorrain, Claude, byname of Claude Gelee (b. 1600, Chamagne, Fr.--d. Nov. 23, 1682, Rome). French artist best known for, and one of the greatest masters of, ideal-landscape painting, an art form that seeks to present a view of nature more beautiful and harmonious than nature itself. The quality of that beauty is governed by classical concepts, and the landscape often contains classical ruins and pastoral figures in classical dress. The source of inspiration is the countryside around Rome--the Roman Campagna--a countryside haunted with remains and associations of antiquity. 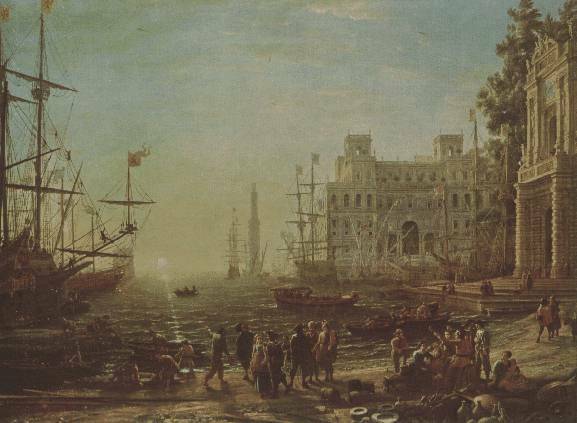 The practitioners of ideal landscape during the 17th century, the key period of its development, were artists of many nationalities congregated in Rome. Later, the form spread to other countries. Claude, whose special contribution was the poetic rendering of light, was particularly influential, not only during his lifetime but, especially in England, from the mid-18th to the mid-19th century.